Authentic NATURE STONE® Brand Flooring can be designed using hundreds of combinations of attractive aggregate stone colors combined with a durable epoxy mixture to provide a diamond-like finish that enhances the beauty and color of the stones. Authentic NATURE STONE® Brand Flooring designs are only limited by your imagination. 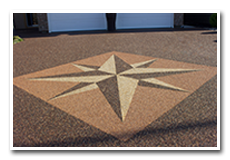 Designs can include intricate borders, complex patterns, multiple colors, various types of stone aggregates, and a variety of inlays such as corporate logos or your favorite sports team. Authentic NATURE STONE® Brand Flooring is suitable for a variety of residential, commercial and industrial uses including laundry rooms, garage and basement floors, automobile showrooms, office building and hotel lobbies and industrial boiler rooms. See product uses for a complete list. Extremely durable and eliminates the cracks and stains prevalent in concrete. Porous, which allows water to pass through, leaving the surface dry and without “puddling” for a more slip-resistant surface. Can be applied over most existing concrete floors with no tear-out costs. Requires minimal maintenanceand can be cleaned much easier and faster than other types of basement or garage flooring (such as tile). Is price competitive with ceramic and quarry tile on a per square foot basis with significantly less maintenance over the life of the concrete floor. Withstands heavy wheel traffic and mechanical impact. Skid resistant when wet, fire resistant, and resist most salt, oil and gas contamination. Has a superior insulation rating (R-value), 2-3 times that of carpeting. To the eye, all stone and epoxy flooring is beautiful. But what you don’t see is the difference in the epoxy – the most critical element responsible for the strength and durability of your Nature Stone® Flooring. We’ve invested countless hours and years researching and testing our formula to bring you an environmentally-friendly, 100% undiluted epoxy. It’s engineered specifically for use with natural color stones and to be applied over existing concrete floors. Only NATURE STONE® Brand Flooring uses a blend of the finest stones and a custom, specially formulated epoxy that ensures maximum strength, adhesion and overall performance. Stone and epoxy flooring is a custom-flooring product. You should be concerned if someone provides you a quote or a price per square foot without physically inspecting the area to be covered. The condition and required preparation of your existing concrete, the type of stone chosen and subsequent required mix ratio, the amount of material needed (thickness to correct uneven areas) to properly install your floor, the access, designs and wrapping of faces or steps are just some of the factors that can dramatically affect pricing. Remember, you’re not simply buying yards of carpet or tile squares off a shelf. Authentic NATURE STONE® Brand Flooring never charges for a site inspection and will always provide you with a firm price. Financing is available for your convenience. Ask about our financing options.